"Never give up! Sing your song!" On the planet Mem a fifteen year ceasefire between the Human Race and the aquatic Selk has begun to fray with both sides chafing under the ceasefire’s draconian terms. To ease tensions and work towards a united future, both races begin an “Ambassador” programme, offering one young adult to enter the other race’s world and speak on behalf of their race for the goal of peaceful unification. Yujo Sippe Palms, a nun in training, has been chosen as the Ambassador of the Land. Caught between two worlds that can not survive a new war, those who would kill to reignite tensions as well as having to adapt to a new world, Yujo must make the case for peace between the two races. And to do that, she has to sing. Heart song: The ballad of the Ambassador has not been tagged yet. Help others find Heart song: The ballad of the Ambassador by tagging it! Heart song: The ballad of the Ambassador has not been reviewed yet. 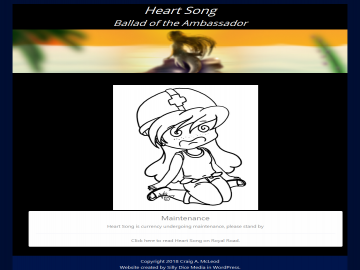 Heart song: The ballad of the Ambassador has not been recommended yet.